Order Online at Castle Studios Productions! 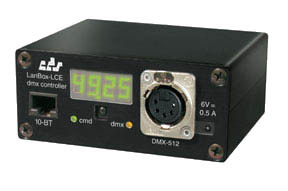 The LanBox-LCE is the mini version of the LanBox-LCX DMX controller, made to run stand-alone, but can also be used for network applications via the built-in Ethernet connection. It's very small, very low priced and very easy to use, yet it supports 512 DMX channels and has the same command set as the LCX. With an of the shelf IR VCR remote controller (not included) you can also select pre-made light scenes, chases or light channels. The four-digit LED display provides simple feedback. The LanBox-LCE can also be used as a network universe for the LanBox-LCX. With 5 LanBox-LCEs and one LCX, you can control up to 3072 DMX channels, distributed over 6 universes. Bundled software includes LCedit+ a graphical lighting editor for MacOS, Mac OS X and Windows 98SE/2000/XP. Includes power adapter, Ethernet cable, and FREE software updates and upgrades! Download the User's Manual for the LanBox products here. Purchase using Visa / MasterCard or PayPal with our secure payment system. For COD orders or payment by check, e-mail us at sales@midilite.com. We ship only to USA & Canada addresses. LanBox orders for shipment outside the USA can be placed at www.lanbox.com. Also available in a Twin Pack! maximum of 1024 active light channels. 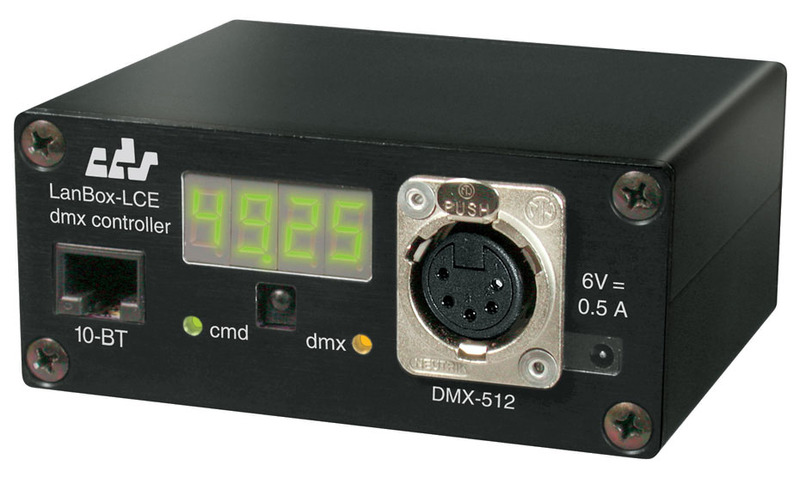 DMX output rate, 20 times per second. Yellow DMX output status LED. Hundreds of cues, divided into maximum of 999 cue lists with 99 cue steps. (The actual maximum number of cues depends on number of channels used in a cue). LC+ firmware & LCedit+ cue editing software. 5-pole XLR female DMX output connector. RJ45 connector for 10BT Ethernet. TCP/IP and AppleTalk over Ethernet. Can be use as a UDP universe for the LanBox-LCX. Support for RC5 (Philips) and Sony IR VCR controllers. Green four-digit LED information display. FlashPROM enables easy upgrading of firmware. 256 KB RAM lighting scenes memory with FLASH storage. Integrated Forth system with custom firmware possibilities. Stand-alone operation & computer supervised shows. Black extruded alluminium case, designed to withstand On-The-Road conditions. Copyright 1995...2004 LanBox is a registered trademark of CDS advanced technology bv. All other names referenced are the service marks, trademarks or registered trademarks of their respective companies.